I hate wearing the same jewelry as everyone else, but customizing a piece can be expensive (especially with the cost of gold and silver these days). Not so with the jewelry at Guzel Jewelry Designs at 1714 Union St.
You can make each piece your own. These three necklaces are made from the same piece by simply stretching it or twisting it or both. When I tried on the necklace I couldn’t stop playing with it. The jewelry is designed by Semiha Durak. She’s originally from Istanbul but now lives in San Francisco. She is also incredibly sweet. When I stepped in her boutique to ask about a piece, she showed me all the different ways I could wear it. Her website also has videos that show all the ways you can customize her pieces. She calls the materials used to create her pieces Creita. It’s made from a flexible metal mesh comprised primarily of copper and silver wire that has been lacquered. It’s also lead free, nickel free and hypo-allergenic. 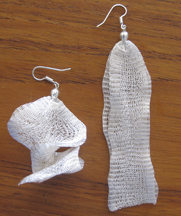 Here are two ways I wear the silver earrings I bought. And her prices are very reasonable. The necklace above is around $45 and the earrings I bought were only $39. This is the perfect jewelry gift for creative people. This year I’m considering buying a pair, in a different color, for every creative girl I know.